I exchanged a chain of bike for the first time. There are tools, and if you work according to the instructions, it is not that difficult. It is convenient to use immediately after being broken in 106 links. It was perfect because I was hoping for a clip formula considering easiness of maintenance, because it is not much power because it is an off-car. This review is about item#61000195. It is excellent in cost performance. 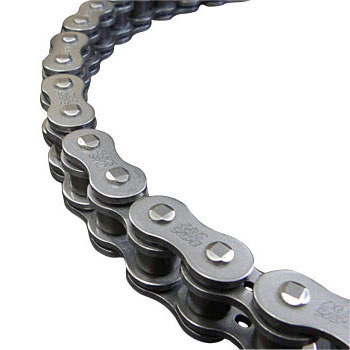 I have been using the EK chain many times, but I am saved because it is durable and light and fuel efficient. I will also use it when exchanging. This review is about item#61000107. I am using it for KLX which increased 250 to 300 cc, but I have 20,000 km. I do not need the cut of the chain, I do not need caulking, there is nothing to say! ! ! ! ! This review is about item#61000204. The price is also cheap, quality is also very satisfied. I think that we would like to use Monotaro sama for the long time because it is a commodity and price which are difficult to obtain at others. The third EK chain Originally, I think that it is a good item of COSPA. Since I exchanged myself this time, I got even cheaper. It seems that life will be extended more if maintenance is done regularly. You can not skimp. Because there was also a bruise, I converted from 428 to 520 and exchanged. I do not really grow, I am impressed with domestic production as expected. This review is about item#61000344. It is always this. A staple product among myself. Because it is a special EK, I challenged the screw joint for the first time this time, but it is good. This is an excellent one. It worked easily, it did not fail. This screw joint is big in choosing EK, not RK or DID. Expense to buy caulking tools and expenses to ask the motorcycle shop float. This review is about item#61000807.